Lets Culinate ! : End of Year Office Parties: Do's and Donts ! End of Year Office Parties: Do's and Donts ! Another year is biting the dust of the sands of time and yes once again many organizations are having their end year parties.Come January the HR & Personnel Departments will have a heck of a time with the suspensions,counseling and even outright dismissals that accompany such events.Office parties remain still strictly business events. It follows that some practical wisdom needs to be applied during this period.This post is not about the ethics and mores that accompany this events, that's up to the personal values of each individual but its focus is on do's and dont's and office party tips from a culinary perspective in no particular order. If you are in HR or the Office Party Organizing Committee -Do Not ask for food samples from a caterer and cancel when the delivery is on the way to your office(had to include this and put it at the top of my list as here at LetsCulinate we have had two major disappointing experiences from high tier organizations where the organizers did not have the courtesy to inform us in advance but waited for the last minute to cancel the request.Caterers have feelings and even free samples involve costs and effort ).Only request for samples when you are serious and committed. Dont hire just any caterer or settle for any food establishment, do some good research and food sampling before you decide on the location or caterer.Food poisoning can be lethal and ending the year with serious food poisoning issues is not a nice way to end one. Do not take a lot of alcohol .It may just limit your inhibitions, ruin your palate, result in vomiting, expose an ugly side of your personality to your employers/colleagues/business associates...etc.Over use and or misuse of alcohol has resulted in flings,ruined marriages,fights between colleagues...etc the list is actually endless.This period is especially a peak period for this kind of events. Dont mix alcoholic drinks.If you are taking wine ,don't take beer after the wine being served finishes.If you are taking beer ,don't take wine after the beer finishes.The issue lies not really in the mixing but the amount of alcohol consumed.If you are unable to take count of the amount of alcohol you have consumed the likelihood of getting discomfort because of alcohol consumed is highly increased.The two old adages "Beer after wine and you will feel fine;wine after beer and you will feel queer" and " Beer before liquor never been sicker;liquor before beer ,you are in the clear" don't count in this instance. Do not take a lot of carbohydrates or meat (Nyama Choma) with the excuse that you are going to drink a lot of alcohol. This just slows the rate of absorption but does not limit the effect of the alcohol eventually on you. Dont overfill your plate.Put a small portion of what you like ,often the food is enough and the service line is often set up to fill you with the less interesting/expensive/tasty stuff. Do not eat too much.Gluttony is not a skill that employers look for nor does it suit in your cv.Dont let it creep in through the office party. Dont cut the food or drink line. Dont eat just anything and everything.You don't want to have a running stomach before your colleagues.Experiment new foods cautiously ,if you have a sensitive stomach stick to your comfort zones. Do take a lot of water and or juices if you intend to take alcohol.At least a glass of water for every glass of alcohol is a good rule to live by. Do avoid spicy and oily foods, you don't want to spend the holidays burning up accumulated fats/calories.It makes for time to relax.Very spicy food may not be too kind to your stomach unless you are used to it. Do take alcohol /wine in moderate amounts .A glass or two of fine wine can actually clear your palate preparing you to enjoy the meal. 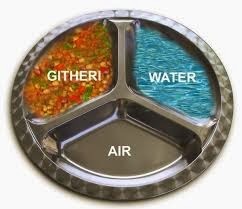 Do leave room for desserts on your plate, unless a separate plate is offered .In that case obey the good advice of Presidential Candidate Abduba Dida Leave room for air and water! Avoid high risk foods i.e fish fillets,fried chicken (especially if they have been sitting in the baine marie/serving bowls for a long period :the moisture around them is fertile grounds for harmful bacteria) beans(Njahi)-unless they have been prepared by a professional chef or cook who has prepared them well and ensured uncooked/unprocessed proteins have been drained off. Be your natural self,remain calm relaxed and cool throughout the event.Your demeanor and self control may just result in career growth and other benefits. 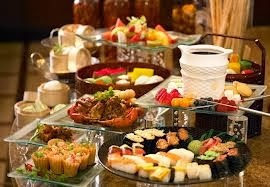 If you are in the HR or Organizing Committee Do Cocktails and Platters this are a safer bet and will allow the staff to better mingle and converse and enjoy the event holistically.At lets Culinate we have an impressive array of avant garde professionalized menu that we are willing to discuss with serious corporate customers. Please note that majority of the tips on this list focus on alcohol use. A lot of the requests we have received the major portion of the budget and emphasis is placed on alcohol rather than food. It seems the end year office party may just be another excuse for over drinking at the office or with the office staff ! If you are interested in a corporate solution for your end year party, menu advice or tips.Kindly drop us a message on our Facebook page.We are currently receiving inquiries and requests.